Good Fix cafe manager Harry Moss shows the Healthier Choice label the south City cafe is using to help customers make healthy choices. A new labelling system being trialled in cafes throughout Invercargill will help diners make healthier choices. Healthy Families Invercargill is hoping the Healthier Choice initiative will help those who are looking to make healthy choices, especially when they are in a rush. The concept involves a simple labelling system that indicates the healthier choices on a menu or in a display, and is being trialled at eleven cafes throughout Invercargill. One of the cafes involved in the initiative is Good Fix Café in south Invercargill. 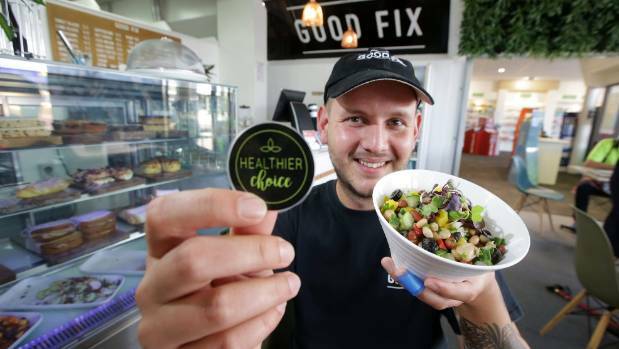 Good Fix Manager Harry Moss said the initiative suited its focus on providing healthy, innovative meals perfectly. “People always perceive healthy food as being difficult, boring, or tasteless, and it doesn’t have to be,” he said. Moss said anything that made it easier for people to make the right food choice was an initiative worth supporting. “It’s about making it easy for the customer. Eating healthier doesn’t have to be difficult, it’s all there in front of you,” he said. The cafe has even made some changes to the classics like bacon and egg pie in order to bring a bit more of a healthy angle to it. “Of course, it still has bacon and egg, but that’s your protein, isn’t it,” Moss said. He said the cafe even does lunch deliveries to take as much of the effort as possible out of eating something healthy. “The excuses for just quickly grabbing a packet of chips just falls away,” he said. Healthy Families Invercargill manager Jared Cappie said the strength of the concept was that it was being done in collaboration with cafes. “It’s such a simple message, but so easy to implement, and it is great that café owners and managers can really take ownership of it all. It’s all about making that healthier choice an easier one for our community,” he said. Communications and engagement adviser Cassandra Pokoney said the concept was about empowering cafes to point out the healthier options on their menu. It relies on the cafes involved to make those judgements, as there are no nutritionists involved to analyse the composition of the food, but what it does do is provide a quick assessment of the options in front of a customer. “It’s saying ‘you’re in my café, here is the healthier options you can choose’,” Pokoney said. She said the strength of the concept was its simplicity, with all of the cafes they have approach about the concept coming on board. Participating cafes are identified by a Healthier Choice sign on the door, and Pokoney said they were looking to get more cafes on board as word about the initiative spread.